Ever wonder what it would look like if Kim Jong-Il was arrested for stealing $2.5 million? Now we know. Jiming Shen was charged with using fraudulent information to get $2.5 million in government funding for his preschool in Staten Island, which he spent on homes and other businesses. 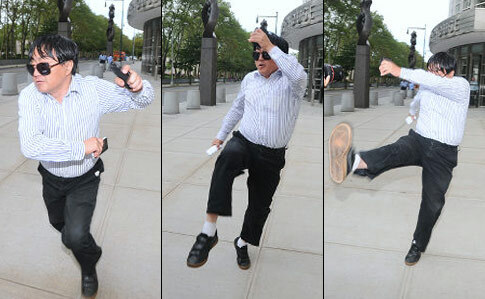 After posting bail and being released from jail, Shen went nuts on the cameramen outside the courthouse, doing what can best be described as fat-man karate. He managed to bloody a photographer’s nose and was promptly re-arrested, shattering the record for quickest arrest after being released from jail set by this guy. In a show of loyalty, his loving wife managed to run away and jump on a bus. Shen suffered a broken arm in the ordeal. Wherever Randy Johnson is right now, I’m sure he’s smiling. Shen needs to forget about running preschools and become a movie star. Pair him with Kevin Hart and make a Martial Law remake. Let’s do this people!